This Improved Performance Open Enigma Mark 4 is hand-crafted, so we build it upon request in the order that they are sold. First come, first served. They come with a unique Serial Number engraved on the plug board. - Printer port to receive our very own printer (or any compatible serial printer). - The wooden box is now long enough to close the flop while the plugboard jumpers are in place. - The Open Source software behaves more like a real Enigma: lampfield only lights up while a key is being pressed. - Software has been modified to easily accept future additional behaviors like Swiss-K, Turpids and Enigma G.
Your assembled & tested Enigma will include everything and will be completely turnkey. It comes with a fully functional plugboard and the M3 emulation behavior. Contact us before you order if you have specific needs. S&T GeoTronics makes quality electronic Open Source Enigma reproductions. It's what we do. Craftsmanship has been explained as the process of being intimately involved with the making of a product that is well-made, long-lasting, attractive and/or desirable. Another identifying factor of true craftsmen is their interest in the process of creating. The focus is on the product, the creative process, and how much enjoyment it brings. These machines are assembled entirely by hand, by us, in our very small workshop. We have no "mass production" equipment. Each case is made from 3/8" selected imported wood, and fitted with the best materials we can obtain. These cases will last as long as the Enigma they contain. We use a quality Arduino Mega compatible and like everything else we do, both the hardware & software are Open Source. The device contains 16-Segment LEDs as opposed to a common LCD to give it this “real” look. These devices are a labor of love, and as such, take a while to create. Each unit takes approximately 20 hours to complete, or approximately two elapsed weeks depending on what other things are going on in our life. We started doing these devices because we wanted one for our own enjoyment and were unable to find a quality reproduction, at a price we could afford. 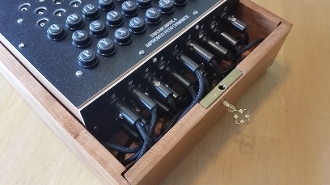 It is our belief that an Enigma replica shouldn't cost more than the originals did. We subscribe to the Japanese concept of "kaizen", and continue to learn and improve with each unit we make, sometimes that becomes a change in design in all future devices, other times that is merely a better way to do the current design. We strive to do the very best job possible, with great attention to detail, so that you will be pleased with your unit, for your satisfaction at the end of the process, is our reward. Please order in confidence or contact us with your specific needs.